The MBTA’s cost estimate for the North South Rail Link (NSRL), released yesterday, is the most recent in a series of estimates for this project. Those estimates, from under $4 billion to over $20 billion, run the gamut of construction methods, infrastructure choices, and cost assumptions. These huge disparities underscore that cost estimates for major infrastructure projects have to be assessed based on their underlying assumptions. TransitMatters believes that there are many reasons yesterday’s cost estimates are as large as they are, not least the assumptions and selective comparisons employed by the MBTA’s consultant. In our report on Regional Rail (excluding the NSRL) we estimated the cost range of systemwide electrification, high platforms to enable level boarding, and strategic capacity improvements at bottlenecks to be about $2 to 3 billion. We stand by that estimate and do not believe the electrification and rolling stock costs estimated in yesterday’s MBTA presentation are consistent with the most relevant and appropriate comparative examples of which we are aware. We read yesterday’s presentation to the Fiscal Management and Control Board as an affirmation of our view that South Station expansion (SSX) should not move forward – it is, by any measure, too little bang for way too much buck. The MBTA’s consultant now estimates SSX will cost $4.7 billion, money that simply does not need to be spent in order to improve the functionality of existing tracks at South Station. There are other, much lower cost approaches to improving operations at South Station as we indicated in our Regional Rail report, and we will offer more a more detailed roadmap to doing that in a follow-up report we expect to release in the early fall. TransitMatters continues to believe that the only route forward for the MBTA is to advance a transition to Regional Rail, an electrified intercity rail system with frequent service during the day. The Regional Rail model is critical. While not critical to implementing a Regional Rail system, the NSRL would be a highly useful enhancement providing the flexibility and connectivity to which many riders and potential riders would be drawn. We hope and expect that a candid and open-minded conversation on both of these initiatives will continue. Without a commitment to a new Business Model for intercity rail, our region will continue to experience crippling traffic congestion and people will be deprived of the kind of access to jobs and opportunity that is necessary for a thriving economy and decent quality of life. We look forward to collaborating with the MBTA and all stakeholders as we make Regional Rail a reality. We're joined in studio by Brad Bellows in this conversation to talk about the state of Commuter Rail and what the North South Rail Link can do for our region. Brad is an architect, board member of the Association for Public Transportation, and a member of the North South Rail Link Working Group which is leading a renewed push to see the connector finally built. 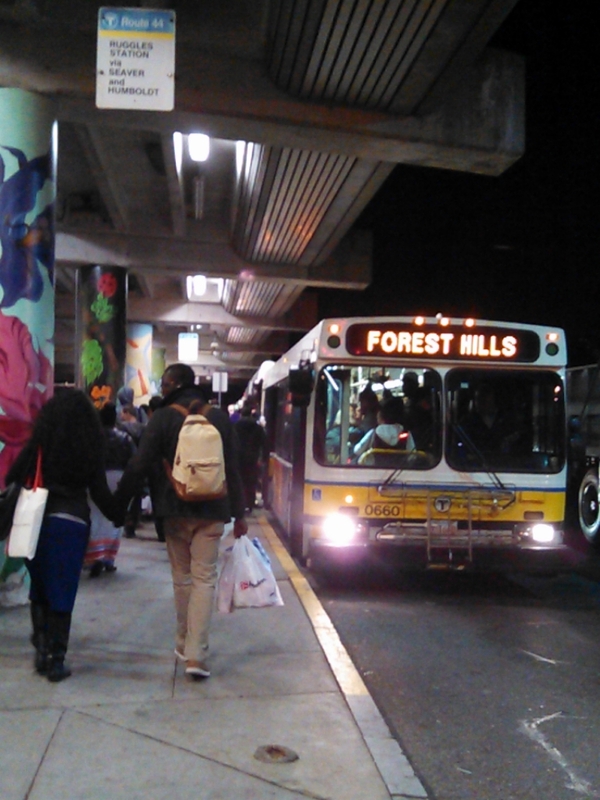 TransitMatters advocates for fast, frequent, reliable and effective public transportation in and around Boston. As part of our vision to repair, upgrade and expand the MBTA transit network, we aim to elevate the conversation around transit issues by offering new perspectives, uniting transit advocates and promoting a level of critical analysis normally absent from other media. Like what you hear? Share it around, tell your friends and colleagues, and subscribe to the blog and podcast (on iTunes) to be notified of new posts and episodes. Support our work by becoming a member, making a donation or signing up to volunteer because we can't do this alone. Let us know what you think: connect with TransitMatters on Facebook or Twitter. Follow Jeremy Mendelson @Critical Transit, Josh Fairchild @hatchback31, Jarred Johnson @jarjoh, Marc Ebuña @DigitalSciGuy, or email us here. "Trust your money to Charlie and save"
The MBTA Control Board voted Monday to raise fares by 10 percent or more despite disruptive protests by community advocates. The extra revenue will be dedicated to infrastructure upgrades, prompting many questions. We'll discuss the bright spots (student pass, transfers, Commuter Rail zone study) and see where we go from here. Federal regulators object to the elimination of late night service without a proper civil rights analysis and mitigation. What does this mean, and what might mitigation look like? Boston held a City Council hearing with the T General Manager on Commuter Rail fares, a small step toward realizing our vision for an integrated regional rail network that becomes the preferred travel option. Community feedback and the responses of the GM say a lot about the current state of the Commuter Rail. Look out for an upcoming City Council hearing on transit signal priority for buses and trolleys, and let your councilors know you want better transit. Former MBTA General Manager and MassDOT Secretary, Rich Davey joins us to reflect on his experience and share insight into the current challenges and opportunities facing the T.
Why has the service become so unreliable? Will we ever plan for and implement system upgrades? How can we better use our existing services and resources? Are the labor and management needs being met? How can the T communicate more effectively as well as advocate for itself and the needs of riders? Can we do effective regional planning and forge a working relationship with advocates and cities? How do we raise revenue, and should that be a priority? We finally put to rest the argument over the word annual: whether fares are legally allowed to rise by 5 or 10 percent. And much more. Prior to running the MBTA, Rich Davey was the General Manager of the Commuter Rail operator. We talk about activating the Fairmount Line and some other ways to improve the Commuter Rail. How might more effective regional planning enable the Commuter Rail to address local and regional transportation challenges? Transit Matters is a non-profit organization working for fast, frequent, reliable and effective transportation in Boston by elevating the conversation on transportation. By offering new perspectives, uniting transit advocates and promoting a level of critical analysis normally absent from other media, we can achieve a useful and effective transportation network because Transit Matters. The MBTA fare increase proposals (presentation, summary) are unnecessary and not even helpful in closing the budget gap. We summarized all the feedback we've received and proposed alternatives to increase ridership and revenue and reduce operating costs. MBTA fares have more than doubled since 2000, far outpacing inflation and exceeding even the increase in housing prices. Meanwhile the state gas tax has increased only 3 cents and no longer supports the cost of road maintenance, but MBTA riders are being asked to pay their own way. Commuter Rail fares and parking fees are some of the highest in the nation despite very infrequent service. Record rents and declining wages are forcing large numbers of people out of the city, to places where Commuter Rail is the only transit but is unaffordable. Low ridership has been cited as a motivation for further service cuts, yet when a day trip costs $84 for a family of four, the Commuter Rail is not living up to its potential as an effective regional transportation network. Ridership is up over 20 percent on all major lines as the city’s population has increased 10 percent in ten years. Trains and buses are slower, more crowded and less reliable than ever. All major rail and bus lines operate over capacity every day and the system does not effectively serve many trips. Failing to increase service by 20 percent is essentially a service reduction. Riders cannot be expected to pay even more without major upgrades such as increased capacity, faster service and new lines — give us a system worth paying for. Higher fares turn T riders into car drivers and make traffic congestion even worse, unless accompanied by major service improvements or a gas tax increase to make drivingless appealing. With gas prices approaching 11-year lows, commuters see transit fares rising and service quality declining and make the obvious choice. Rather than continue the death spiral of service cuts (yes, eliminating late night service = service cuts) and fare increases until transit is no longer effective and streets are completely gridlocked, now is the time to reverse course and invest heavily in public transportation, including maintaining or lowering fares. No major investments have been made to the system’s core since the 1980s and we are now paying the price as the MBTA slowly falls apart. The MBTA has made significant progress on reforms but the promised revenue in “reform before revenue” remains elusive. No efficiencies will ever fill the $7 Billion budget gap -- and that's just to reliably run what we have now, without desperately needed upgrades. If we don’t start investing now, the system will only get worse, and it will only cost more when we eventually have no choice. Riders are not responsible for chronic underinvestment and cannot be asked to shoulder the burden of ever increasing debt service payments. Soaring housing costs and declining wages are forcing many people to move to places with poor transit access. We have repeatedly cut service and raised fares on these "low ridership" services, while ignoring others with great potential. Governor Baker said there should be no new taxes or fees — apparently not including T riders. The agency’s 4% cost growth is in line with the Governor’s call for a 5% increase in state spending elsewhere. So why is the MBTA Control Board subjecting T riders to a higher standard? Good transit provides many benefits to all of society — even those who never use it. Public transportation supports dense, vibrant communities where everyone has access to basic needs and the freedom to move around the region. Last winter showed us just how important the MBTA is to the entire state’s economy: without the T, all of our favorite stores, restaurants, institutions and entertainment venues would be unable to attract sufficient customers and employees. Imagine a transit system with the resources to run excellent service every day and make people actually want to use it. Traffic congestion on our streets and highways is worse than ever because of our failure to upgrade and expand the transit network. Boston EMS ambulance response times have increased 16 percent since 2009, the Boston Fire Department takes one minute longer to respond to calls, and buses spend much of their trip stuck in traffic. Only by expanding transit so it is useful for more people will we create space for essential services and emergency vehicles. Fare increases only put more cars on the road. Over 100 years after the first subway construction in Boston, the region’s poorest, most underrepresented neighborhoods still lack rapid transit access. Communities such as Chelsea, Roxbury and Mattapan have the longest trip times (often slower than walking) and least reliable bus service. These riders are also most heavily impacted by rising fares, often cutting back on groceries or skipping social events due to the cost of transportation. Special attention should be focused on bringing fast, frequent and more affordable transit to our most vulnerable riders. Riders are doing their part to support vibrant communities, reduce traffic and address climate change. We should reward - not punish - those who use the MBTA by maintaining or lowering fares across the system and investing in faster and more effective service. Our transit network is a valuable public service, not a profitable business, and it's time we started treating it like one. Many simple changes could improve the user experience and help alleviate capacity constraints until service can be expanded. The T should experiment with several options in an effort to upgrade service and reallocate inefficiently used resources, and as alternatives to (or mitigation for) a fare increase. In other words, what improvements are we getting for the higher fees? Instead of a single transfer, allow unlimited transfers within 2 hours on bus, subway and Commuter Rail, to permit trips through downtown and between non-downtown points. Currently it is impossible to go from Roxbury to Chelsea, Everett to Brighton Center, or Roslindale to Brookline (just a few examples) without two fares or a very long trip with a transfer downtown. Removing the barrier would allow riders to make more efficient trips and access more jobs while increasing ridership (and revenue) and reducing congestion in the downtown transfer stations. An unlimited transfer — think of it as a 2-hour unlimited pass — is in effect on transit systems across the country such as Portland, Minneapolis and San Francisco. Implement all-door boarding on buses and trolleys. Pass users could board at any door and special fare inspectors would conduct occasional inspections, issuing a fine to riders who haven’t paid. Up to 30 percent of Green Line and bus travel time is spent sitting at stops while riders line up in the cold waiting to tap their card. Keeping buses and trolleys moving means faster service, more frequent service, more evenly spaced trains/buses, reduced fare evasion and lower operating costs. All-door boarding is now standard practice on nearly all North American light rail lines and San Francisco has expanded it to all buses. Reduce Commuter Rail fares on off-peak and weekend trains. As record numbers of urban dwellers leave the region’s core to escape soaring rents, the Commuter Rail has the potential to dramatically improve their quality of life. Yet commuter Rail fares are too expensive, even off-peak trains operate with hundreds of empty seats that could offer a fast new service to riders of all income levels. Thousands of riders endure long trips on crowded buses or limit their economic and social opportunities because of transportation costs. Many more drive choose driving over the high train fare, adding thousands more cars to our streets every day. Extend Zone 1A (subway fare) to include all stations within 12 miles of downtown Boston, roughly the distance to Braintree, Waltham or Lynn, or anywhere within Route 128. It is expensive to provide very frequent service on slow, crowded buses to places like Hyde Park, Roslindale, Waltham and Lynn while train cars run empty. Heavily discount Commuter Rail fares during off-peak periods and on weekends. Chicago and Philadelphia have seen large ridership increases with their $8 unlimited weekend (Chicago) and $12 unlimited (Philadelphia) off-peak passes. Integrate fares between subway, bus and Commuter Rail so that riders can pay with a CharlieCard. Issue transfers valid between the Commuter Rail and a subway or bus line. Add a credit card payment option. Coordinate bus connections at terminals, stations and transfer locations. Improve scheduling of connecting services and hold buses and trains for close connections during times of less frequent service. Upgrade bus stops, stations and terminals to improve service quality and comfort, allow more efficient bus and passenger circulation and increase ridership at very low cost. Implement transit priority measures on city streets for faster, more reliable and less costly bus and trolley service. Faster service and increased on-time performance were among the top requests from participants in the GoBoston 2030 transportation planning process. Many simple signal modifications and street design changes would help meet these goals. If fares do increase, offer free and discounted passes for low-income riders through social service programs such as SNAP, WIC and MassHealth. Expand student pass programs through cities and university groups. However, the availability of low-income discounts must not serve as a justification for fare increases. Speak up at a public meeting, submit comments and contact your representatives. Your city and state elected officials need to hear from you; remind them that the MBTA benefits everyone in the state and we must make up for our past mistakes. Otherwise the death spiral of high fares and poor service will continue -- more breakdown, delays and late trains/buses -- until our once-proud transit network falls apart for good. We sat down with urban transit student and author of the popular Pedestrian Observations blog, Alon Levy, well known among advocates for his knowledge of best (and worst) practices in urban planning and transportation. In a time of short-sighted cost-cutting and privatization efforts, it is refreshing to hear smart and effective ways to use our existing transportation assets. We spend some time debunking the myth that new technology like the Hyperloop or personal rapid transit will solve our problems. Instead, we know how to address our challenges using existing technology, for example, modernizing commuter rail, increasing core system capacity and upgrading the network to serve modern travel needs. Using electronics before concrete. And of course, we cover the MBTA's Control Board and the ongoing mess, including privatization, late night service, the Green Line Extension, North South Rail Link, and try to learn why construction costs so much. The Transit Matters Podcast is your source for transportation news, analysis, interviews with transit advocates and more. By offering new perspectives, uniting transit advocates and promoting a level of critical analysis normally absent from other media, we can achieve a useful and effective transportation network because Transit Matters. Like what you hear? Share it around, tell your friends and colleagues, and subscribe to the blog and podcast (on iTunes) to be notified of new posts and episodes. Support our work by becoming a member, making a donation or signing up to volunteer because we can't do this alone. Let us know what you think by connect with TransitMatters on Facebook or Twitter. Follow Jeremy Mendelson @Critical Transit, Josh Fairchild @hatchback31, Jarred Johnson at @jarjoh, Marc Ebuña at @DigitalSciGuy, and or email us here. This show is focused on MBTA advocacy, with the full crew sharing our thoughts on some of the things in the media lately, and which we've been working on. Fares increases are proposed again despite the absence of a vision for upgrading and growing our network. It's hard to ask people for more money without real improvements. Some say we should give discounts to low-income riders and raise fares for everyone else. We explore why a two-tier transit system is a terrible idea that will lead to a death spiral and actually impact the poorest riders most. Also, if a transit fare is not a tax, is it a fee? The MBTA board (FMCB) has proposed eliminating up to 28 bus routes, largely without any analysis of what these routes do or how they operate. A better approach is to figure out why some routes are expensive and/or attract low ridership, such as poor service quality (on-time performance, frequency, connections) and many seem to be designed to fail. The existing late night service is one example, but rather than get rid of it, service should be vastly improved and expanded to full overnight service (don't forget the early morning needs!). Commuter rail come up too. We talk about the importance of good service planning, the different levels of planning, and how we can not only make small routine changes but also design a better network. Aside from service cuts, no routes have changed since 2008 and a comprehensive review has never been done, even though travel patterns have changed a lot since the 1964 creation of MBTA. Most routes do not meet basic service standards like crowding and on-time performance. How can we plan for upgrades? The Green Line Extension is way over budget and horribly mismanaged, largely due to schedule pressures, not enough MBTA staff to oversee this massive project (due to austerity) and as a result contractors scamming the T. Are we learning the lessons as the FMCB looks to cut the budget even more? We explain the importance of carrying out the GLX plan which was approved through an extensive public process, and how proposed project reductions would actually cause us to spend more in operating costs to run the line.